Ever wanted to find out more about the Waterloo Diorama in The Royal Green Jackets (Rifles) Museum? 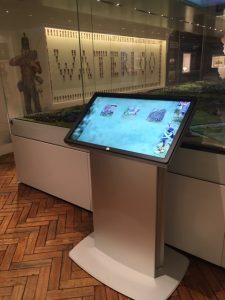 There is now a new touchscreen in the Waterloo Gallery at the Museum where you can learn more about the action, historical characters and other items of interest portrayed on the model. The touchscreen highlights points of interest including the square formations, the surgeons working and even gardener protecting his cabbages during the battle. There is also a quiz so that you can test your knowledge to see how much you have learned.